Pleasant man giving red christmas present gift box. Green screen hromakey background for keying. Portrait of a happy caucasian man giving gift boxes on camera. Green screen hromakey background for keying. Little boy shaking red gift box. Giving a present for birthday. Green hromakey background for keying. Beautiful woman giving red gift box. Green hromakey background for keying. Young teen boy with gift boxes and hat for christmas. Portrait of handsome guy giving presents for xmas. Green screen hromakey background for keying. 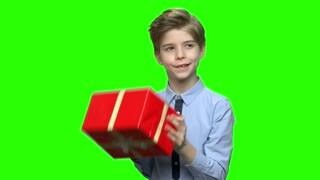 Portrait of caucasian teenage boy giving yellow gift box for holiday. Present for your birthday. Green screen hromakey background for keying. Young teenager giving gift box. Red present. Green screen hromakey background for keying. Portrait of teenage boy giving present gift boxes. Green screen hromakey background for keying. Child boy giving red gift box. Green hromakey background for keying.